Yeast cells can sometimes reverse the protein misfolding and clumping associated with diseases such as Alzheimer's, according to new research which contradicts the idea that once prion proteins have changed into the shape that aggregates, the change is irreversible. Prions are proteins that change into a shape that triggers their neighbors to change, also. In that new form, the proteins cluster. The aggregates, called amyloids, are associated with diseases including Alzheimer's, Huntington's and Parkinson's. For yeast, having clumps of amyloid is not fatal. In a new study, researchers exposed amyloid-containing cells of baker's yeast to 104 F (40 C), a temperature that would be a high fever in a human. When exposed to that environment, the cells activated a stress response that changed the clumping proteins back to the no-clumping shape. The finding suggests artificially inducing stress responses may one day help develop treatments for diseases associated with misfolded prion proteins. and senior author of the paper in eLife. "When you get Hyde, all the prion protein that gets made after that is folded in that bad way. "People are trying to develop therapeutics that will artificially induce stress responses. Our work serves as a proof of principal that it's a fruitful path to follow." To accomplish their jobs inside cells, proteins must fold into specific shapes. Cells have quality-control mechanisms that usually keep proteins from misfolding. However, under some environmental stresses, those mechanisms break down and proteins do misfold, sometimes forming amyloids. Cells respond to environmental stress by making specific proteins, known as heat-shock proteins, which are known to help prevent protein misfolding. Serio and her students wanted to know whether particular heat-shock proteins could make amyloids revert to the normal shape. To that end, the team studied yeast cells that seemed unable to clear themselves of the amyloid form of the prion protein Sup35. The researchers were testing one heat-shock protein at a time in an attempt to figure out which particular proteins were needed to clear the amyloids. However, the results weren't making sense, she said. So they decided to stress yeast cells by exposing them to a range of elevated temperatures - as much as 104 F (40 C) - and let the cells do what comes naturally. As a result, the cells made a battery of heat-shock proteins. The researchers found at one specific stage of the cell's reproductive cycle, the yeast could turn aggregates of Sup35 back into the non-clumping form of the protein. 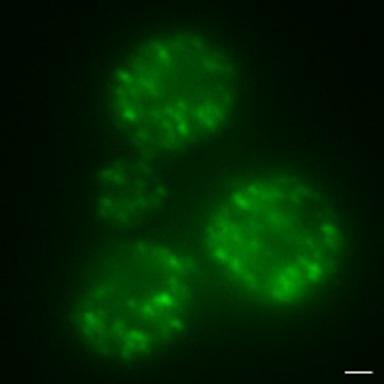 Yeast cells reproduce by budding. The mother cell partitions off a bit of itself into a much smaller daughter cell, which separates and then grows up. The researchers found in the heat-stressed yeast, just when the daughter was being formed, the mother cell retained most of the heat-shock proteins called chaperones, especially Hsp-104. As a result, the mother had a particularly high concentration of Hsp-104 because little of the protein was shared with the daughter. The mother cells ended up "curing" themselves of the Sup35 amyloid, although the daughters did not. The degree of curing was correlated with the concentration of Hsp-104 in the cell, and the higher the temperature the more Hsp-104 the cells had. The Hsp-104 takes the protein in the amyloid and refolds it, Serio said. But she and her colleagues found that just inducing high levels of Hsp-104 in cells by itself does not change the amyloid protein back to the non-clumping form. "Clearly the heat-shock proteins are collaborating in some way that we don't understand," she said. Having the amyloid-forming version of the protein is not automatically bad, she said. It may be that shape is good under some environmental conditions, whereas the non-aggregating form is good under others. Even in humans, amyloid forms of a protein can be helpful, she said. Amyloid proteins are associated with skin pigmentation and with hormone storage. To clear the amyloid from yeast cells, these experiments triggered cells to make many different heat-shock proteins. Serio now wants to figure out the minimal system necessary to clear amyloids from a cell. Knowing that may help the development of drug therapies for amyloid-related human diseases, she said.